It’s been almost 10 years since the 2004 Sumatra-Andaman-Aceh great earthquake produced a tsunami that devastated the area around the Indian Ocean. The Pacific Tsunami Warning Center put together this brief video showing the progression of Earthquakes over the last decade, including both pretty small ones and large ones. Awesome to see how completely they’re controlled by plate tectonics and how the occasional rare “great earthquake” does pop up. Common wisdom — from Southern California to the South Pacific — for coastal residents and scientists alike has long been that offshore islands would create a buffer that blocked the power of a tsunami. 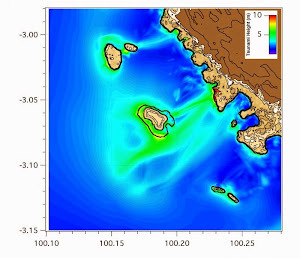 In fact, computer modeling of tsunamis striking a wide variety of different offshore island geometries yielded no situation in which the mainland behind them fared better. Instead, islands focused the energy of the tsunami, increasing flooding on the mainland by up to 70 percent. “This is where many fishing villages are located, behind offshore islands, in the belief that they will be protected from wind waves. Even Southern California residents believe that the Channel Islands and Catalina will protect them,” said Costas Synolakis of the USC Viterbi School of Engineering, a member of the multinational team that conducted the research. The research was inspired by a field survey of the impact of the 2010 tsunami on the Mentawai Islands off of Sumatra. The survey data showed that villages located in the shadow of small offshore islets suffered some of the strongest tsunami impacts, worse than villages located along open coasts. Subsequent computer modeling by Jose Borrero, adjunct assistant research professor at the USC Viterbi Tsunami Research Center, showed that the offshore islands had actually contributed to — not diminished — the tsunami’s impact. Synolakis then teamed up with researchers Emile Contal and Nicolas Vayatis of Ecoles Normales de Cachan in Paris; and Themistoklis S. Stefanakis and Frederic Dias, who both have joint appointments at Ecoles Normales de Cachan and University College Dublin to determine whether that was a one-of-a-kind situation, or the norm. Their study, of which Dias was the corresponding author, was published in Proceedings of the Royal Society A on Nov. 5. The team designed a computer model that took into consideration various island slopes, beach slopes, water depths, distance between the island and the beach, and wavelength of the incoming tsunami. Machine learning is a mathematical process that makes it easier to identify the maximum values of interdependent processes with multiple parameters by allowing the computer to “learn” from previous results. The computer starts to understand how various tweaks to the parameters affect the overall outcome and finds the best answer quicker. As such, results that traditionally could have taken hundreds of thousands of models to uncover were found with 200 models.